Current homeowners are also purchasing homes in an effort to take advantage of the recent price increases. They hope to sell at a decent price while also upgrading to a home that better suits their lifestyle. 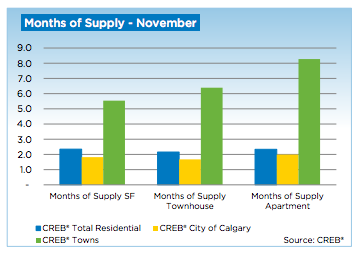 In November, a total of 1,823 new listings were placed on the Calgary market. This represents a 12 percent increase over the number of new listings posted in November 2012. Nonetheless, these figures remain below long-term trends and the total inventory levels are still less than normal for this time of the year. Due to the tight market conditions, all sectors within the Calgary market have experienced higher-than-expected price gains. Nonetheless, only the price of single-family homes has recovered from the recent economic troubles. While these figures have started to push above the unadjusted figures from 2007, townhouse prices and condominium apartment prices are still below peak levels. In November, single-family benchmark prices reached $470,600. This represents an 8.5 percent increase when compared to the same time last year. Condominium apartments totaled $279,600 and townhouses totaled $305,700. Both figures fall 6 percent short when compared to 2007 peak pricing. The total number of year-to-date sales for single-family homes reached 15,533 by the end of November. This represents an 8 percent increase when compared to the same time last year. The increase in sales activity when comparing these figures is largely attributable to the stronger market activity that has taken place during the second half of the year. The overall inventory levels of condominium apartments remained at 26 percent than when compared to 2012. Nonetheless, new listings were at 23 percent while sales growth was at 20 percent. The total year-to-date sales activity also increased by 15 percent to 3,787 units. Condominium townhouse sales saw a 21 percent increase when compared to last year, with a total of 3,002 sold within the first 11 months of 2013. The condominium townhouse sector has recorded the largest increase in sales when compared to other sectors of the market. Sales growth in the communities surrounding Calgary has also outpaced sales growth within the city. This is largely because these communities offer a family-friendly environment while costing far less than properties within the city.